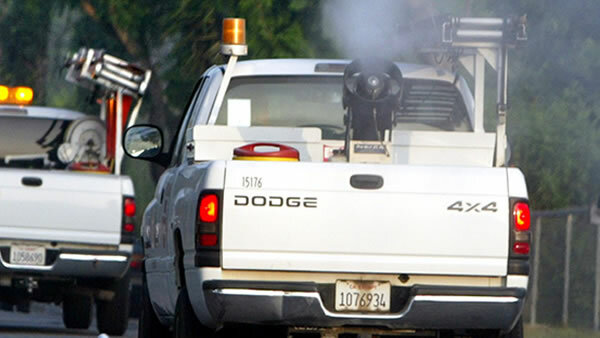 SANTA CLARA CO, Calif. -- The Santa Clara County Vector Control District will conduct fogging operations on Wednesday night after confirming adult mosquitoes collected in parts of the South Bay and Peninsula tested positive for West Nile virus last Friday, district officials said. The infected mosquitoes were found in San Jose, Mountain View, Los Altos and Los Altos Hills, prompting fogging treatment planned from 11 p.m. Wednesday to about 4 a.m. Thursday, according to the vector district. Door hangers notifying residents of the fogging are being distributed in the affected neighborhoods today and Wednesday. According to district officials, there is no need to relocate during fogging. However, Bonilla suggests those who want to minimize exposure to the pesticide should avoid going outside and keep windows closed. West Nile virus typically does not cause symptoms in most people but seniors or people with chronic medical conditions could be at a higher risk, Bonilla said. Symptoms of West Nile virus may include fever, headache, body aches, and in severe cases, neurological damage or death, according to district officials. The district encourages residents to eliminate standing water where mosquitoes might breed and lay eggs by regularly dumping and draining pots, bird baths, toys, cans, rain gutters, pet dishes, buckets or other items. The district also encourages residents to report potential mosquito-breeding sources such as neglected pools by calling (408) 918-4770.